Ranking is used to recode the data into their rank ordering from smallest to largest or largest to smallest. We will demonstrate this by entering in some data and ranking it in SPSS Statistics. 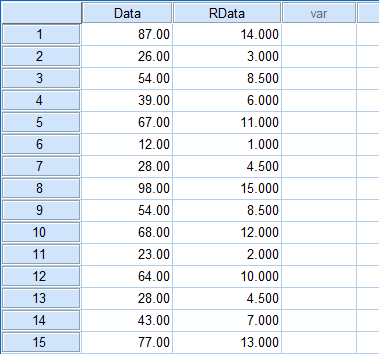 Table:Data to enter into SPSS Statistics. 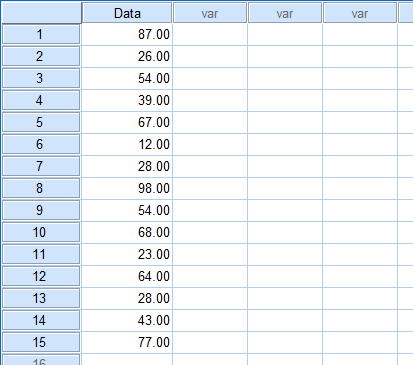 Note: We have named the variable as Data, which you will see reflected in the name of the column (i.e., ). Remember that each individual's results go on a separate line (row) in SPSS Statistics. Click on the Data variable in the left-hand box, and click the button to move it to the Variable(s): box. Next, uncheck the Display summary tables checkbox. If you want to have the largest value to have a rank of "1", select the radio box Largest value from the –Assign Rank 1 to– box. We will stick with the default in this example, which is Smallest value. 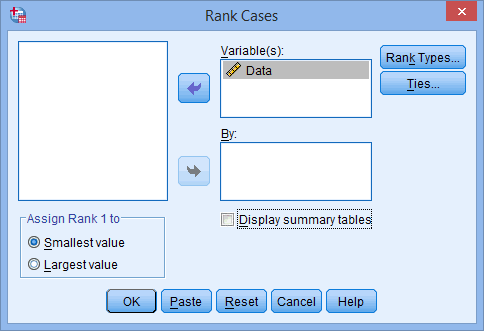 You will be presented with the SPSS Statistics Data Editor, which will now show the ranked data under a new variable name. This new variable name will have the same variable name as the old name, but with the addition of the letter "R" at the beginning. 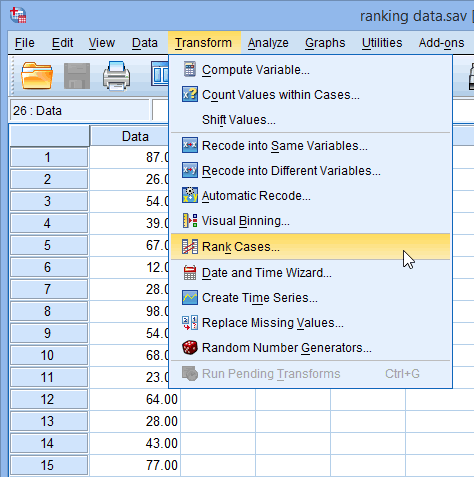 Hence, in this example, the ranked data variable is called "RData".